In math class, we all taught 1/0= infinity. The equation simply shows the mathematical relation between these two numbers and infinity. It shows the connection between these three. So we know its connected each other. Its is amazing that we can make formulas and equations in philosophy too. Albert Einstein is not only the most renowned scientist of the 20th century, he was a great philosopher too. 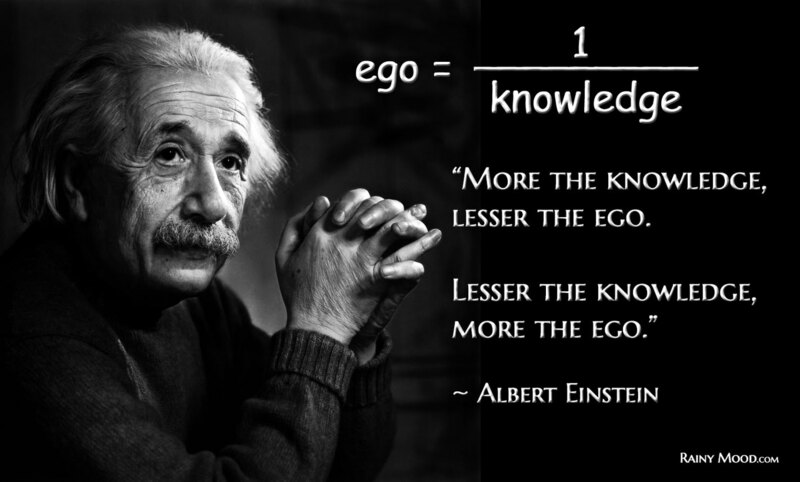 Here Einstein suggests a philosophical formula that states ''More the knowledge, lesser the ego. Lesser the knowledge, more the ego. Does that make sense to you. He points that if the person acquires more and more knowledge in his life, he appear to be a man of values. A man of values and ethics cannot be a selfish man. Hence, the selfishness in his character is lessened. Most people misinterpret college graduation and scientific knowledge is what we call as knowledge. It is greatest of mistake about knowledge. A human is a social being. We live in a society. What we do all the day is interacting with other people. A teacher interact with students, a scientist do research works in order to explore new things for others. Every work, every act we do is an interaction with the rest of the society. Now consider a person living in solitude. He doesn't talk or meet other people. But he can't sit alone without thinking about other people or himself. So knowledge is simply how much we know about the world and nature we are living. As the level of knowledge increases, we begin to understand others and ourselves. Knowing that not all people are created equal. If a person is born as blind, it is not his fault. Then it is not the fault of a foolish person for he is like that. Just as tall and short people on earth, there is the wise and fool person. So how knowledge is related to ego. Ego is something we feel we are better than others. Trying prove it by competing with others. Ego is the strive to win even in an argument too. A man of knowledge accepts both the foolishness of a fool and intelligence of a wise man equally. What we do if an innocent child hit us. Are we going to revenge on him..? No, because that child is in growing stage. His brain is not developed. The case is almost the same. The wise men are able to consider a foolish person as a child. He is not going to strive to win an argument with a fool. He possibly leaves. He is learned one, who does not bother about how other people think about him. Let's take Albert Einstein itself. What he did all the years in his life. He did so many contributions to the society. He just focused on his own work serving the society. It is not his business to think that he is better or worse than anyone else. He does selfless works we can assume. So here we can make another formula too. Lesser the ego lesser the selfishness.